I’ve always considered myself a reluctant runner. When our mum passed away four years ago, my sister, who lived in Borehamwood, was already into the running thing. First a “Fun Run” 5k (although how a slog through a wet park could be fun was beyond me), then a Race for Life, followed by 10k for Shaare Tzedek Medical Centre. Running was a great stress-buster, she’d tell me, breathless on the phone after a training session. I’d politely disagree and reach for the chocolate. I thought she was mad. But never underestimate the power of sibling persuasion. 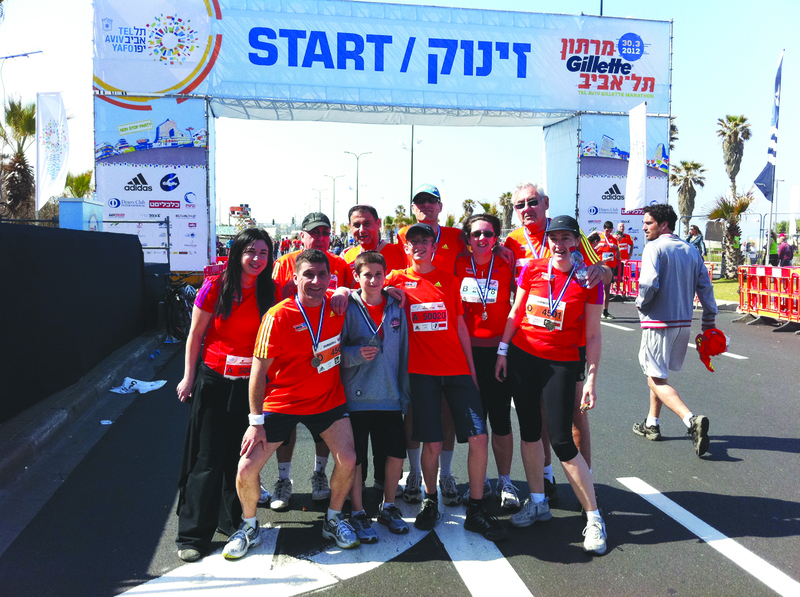 Thus I ended up running my first 10k, at the Tel Aviv Marathon in 2012, alongside a big crowd of family and friends. We fundraised for Magen David Adom UK, raising enough to purchase and equip a new paramedic motorbike in my mum’s name. Back then, the concept of participating in a sporting event for a good cause was totally unknown in Israel. Israelis are, by and large, notoriously competitive, insanely adventurous and crazy about keeping fit. And tzedakah, giving to charity, is the bedrock of both secular and religious values. But the idea of marrying these ideas together was considered, frankly, just weird. I don’t think our MDA fundraising drive was the game changer here. Probably a bunch of Israelis doing the Helsinki, London or New York marathons noticed all the guys and girls in the furry costumes and thought: “Cool!” Charity sponsorship took off and, as is the way of things in this country, became a hit. This year, the organisers of the Tel Aviv Marathon have created a special ‘Running for a Cause’ website, under the banner ‘Make a Change with Every Step’. Participants can pick one of 76 different non-profits, create a fundraising page, and Marathon TLV will distribute the funds. So far participants have raised nearly £54,000. She may have unwittingly jogged past brothers Bradley and Adam Wine while they raced to work in the City from their home in West Hampstead. They, unlike us mere 10k-ers, are heading out to Israel to do the full Marathon, as part of a 10-strong team running on behalf of the Leeds Jewish Welfare Board. 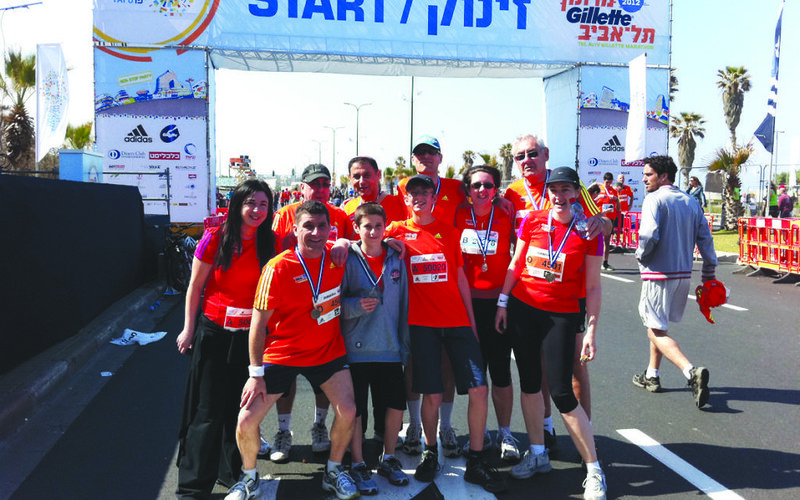 When the London Marathon team announced it would hold this year’s event on the second night of Passover, the LJWB decided to put together a team for Tel Aviv instead. Adam, 24, a trainee accountant with PwC, says they’ve been training pretty intensively for three months. Both are keen footballers and Bradley plays for Oakwood. The whole family is involved in their adventure. Sisters Elissa and Vikki are each running the half marathon; brother-in-law Mark Popplewell is also doing the full marathon. Their mum and dad and their two other sisters, Natalie and Carly, will be cheering them on from the sidelines. Tell me about it. Like my fellow runners, I’m anxiously watching the weather forecast and hoping for an overcast day with gentle breezes coming in off the Med. Yallah, let’s run.